Graduating from The Royal College of Art in London with first-class honors, Wood received a Fulbright scholarship to study at Parsons School of Design in New York. After four years, Wood returned to London as a sought after fabric designer. In 1976, after spending a year in San Francisco, she settled in Los Angeles -- not far from her idols' homes in Beverly Hills. "I idolized America. It was so different to my life in England." That fascination with all things American led to the introduction of cars into her paintings. After all, what personified the United States more than the automobile, especially the tail-finned monsters of the '50s and '60s? 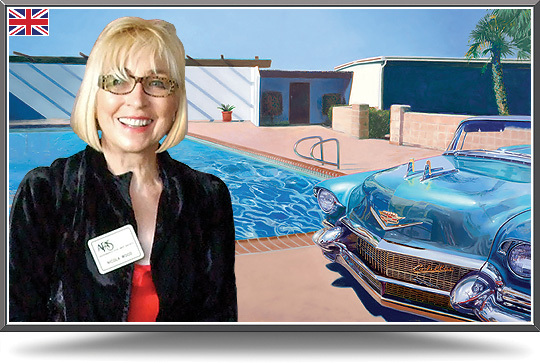 In 1981, she was mesmerized by a black '59 Cadillac which gave her a tremendous urge to put the car onto canvas. That first automobile set the tone for her work ever since. "Gradually, I was exposed to cars that one rarely sees on the road: classic marques like Delahaye, Bugatti, Voison, and Talbot-Lago." Yet, she is anything but a 'car painter.' Though vital to her art, cars are by no means the only element. In 1988 the Automotive Fine Arts Society invited Wood to join its ranks. Since then, the AFAS membership have twice given her their prestigious Peter Helck Award, as best automotive artist of 1993 and 2009. The Pebble Beach Concours d'Elegance, mecca for automotive fine artists as well as for automobiles, has recognized Wood's talent on several occasions. She was the featured artist in 1993, when her painting of a 1931 Cadillac graced both the event's poster and program cover. In 1997 she was again the featured artist at Pebble Beach, and in 2002 was selected for a third time, to celebrate Cadillac's 100th anniversary. Wood is a five-time winner of the much sought-after AFAS Athena Award of Excellence. She has shown her work at the Meadow Brook Concours d'Elegance -- where she won the Raymond E. Holland Award for outstanding artist -- as well as concours at Amelia Island, Florida, Pebble Beach, and Newport Beach, California. Her work has run as cover art, and been featured in pictorial spreads by numerous car magazines such as Road & Track, Automobile and Car Collector. Many of her original oil paintings are in the major collections of corporations and individual patrons. 'Delahaye in Death Valley' and 'Blue Delahaye' were purchased by Peter Mullin, and now displayed at the Mullin Automotive Museum in Oxnard, California. In 2001, Nicola had a one-woman show at the Petersen Automotive Museum in Los Angeles, California. Sponsored by Cadillac, next to each painting was placed the actual car featured in the art, including her own 1962 Cadillac convertible. Commission Nicola to create a unique painting for you!